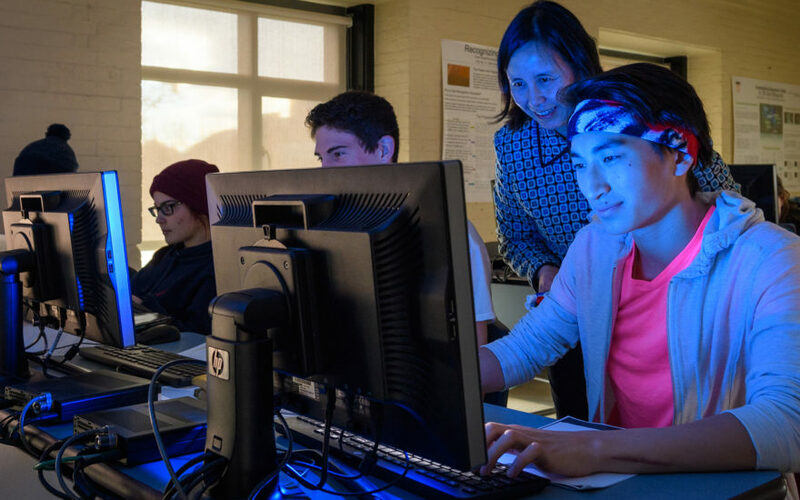 Clark’s computer science major is designed to help our students solve complex challenges across a range of fields. You’ll develop a sound foundation in theory and practical applications while learning how computer science can improve humanity. Through collaborations with faculty and exciting research opportunities, you’ll apply your knowledge to pursue new innovations limited only by your imagination. From exploring ways to make purchases with our smartphones to composing music, communicating via the internet, and improving health care, you’ll use creative problem-solving skills to better our world. Why Study Computer Science at Clark University? Develop a firm grounding in both theory and practical applications, as part of a program that closely follows Association for Computing Machinery/IEEE program guidelines. Compete in prestigious computer science competitions and dive into original research as early as your first year. Benefit from a wealth of opportunities to apply your learning in a professional setting right here on campus — such as working as a teaching or research assistant, or as technical staff for the department’s computer lab or Clark’s Office of Information Technology Services. Follow in the footsteps of graduates who have embarked on a range of exciting careers — our alumni work as software engineers, systems and IT staff, research scientists, and program managers, with some holding positions at Amazon and Google. 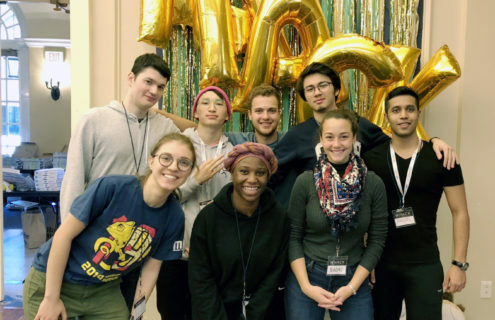 Whether creating apps that provide commuters with the most carbon-neutral paths to their destination or connect victims of natural disasters with volunteers who can help, Clark computer programmers are winning prizes at hackathons at home and abroad. As a computer science major, you will learn to solve problems by looking at them from different angles, breaking them down into manageable chunks, and creating efficient solutions. As you learn to think computationally and analytically, you will tackle problems of increasing difficulty — some on your own, and others by working collaboratively in teams. And by studying in a liberal arts setting, you’ll gain a broad perspective on the implications of computer science for human well-being. Thirteen courses are required to complete the major. One year (two semesters) of calculus. Two courses in the fundamentals of computer science and one in discrete mathematics introduce you to the field. Four intermediate-level courses (core requirements) expose you to the principles of computer science. Four courses of your choice allow you to explore applications and advanced topics of particular interest to you. You also can arrange to take a one-on-one directed readings course with a professor on a specialized topic of your choice, or take additional computer science classes at Worcester Polytechnic Institute through the Higher Education Consortium of Central Massachusetts. Because computer science has so many applications, it is naturally interdisciplinary. You might choose to complete a second major, a minor, or a concentration in a related area of interest. Clark’s minor in innovation and entrepreneurship is particularly relevant if you’re interested in starting a business or bringing a product to market. You might also work with a faculty member in another department on a problem of mutual interest. Mathematics and computer science students and faculty have access to 24 state-of-the-art computers running Linux and Windows; the Computer Science Department and its student systems administrators manage the Linux partition. Computer science students also use the lab to obtain teaching assistant (TA) hours and to participate in group projects. In addition to the computer science laboratory, many mathematics and computer science majors work in the department’s research laboratory on projects in mathematical and computational biology. The research laboratory contains two iMac computers, one PC running Windows, and an LED screen for projecting images/presentations from these machines or personal laptop computers. The laboratory’s computers are linked by Ethernet to the general-purpose University computers and the University’s high-powered computing cluster. Learn more. At Clark, your education extends beyond the classroom. LEEP Center advisers can help you choose from a range of opportunities that complement your coursework and let you put your computer science knowledge into practice. The computer science major is designed to help you learn outside the classroom. For example, as you become increasingly proficient, you will be encouraged to apply or share your knowledge of computer science. You might create an application that addresses a need on campus or in the community, or facilitates a research question. Some computer science majors volunteer to tutor students in local schools. Many students take advantage of internship opportunities during the academic year or over the summer to connect what they’re learning with their professional development. You have opportunities to sharpen your computer science skills by working as a teaching assistant, doing research, proctoring a computer lab, or serving as system, support, or technical staff in the department or for Clark’s Office of Technology Services. In alignment with Clark’s LEEP philosophy, participation in a Study Abroad and Away program is an opportunity to gain world and workplace experience to complement your on-campus experience. Clark approves semester, year-long, and summer opportunities to earn credit through academic coursework, internships, community-based learning, or research. 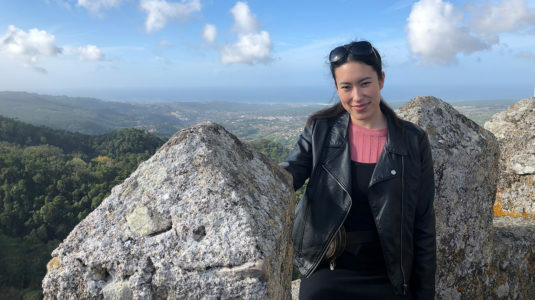 Explore our Study Abroad and Away website where you can search programs by academic interest, location, and language; after you’ve identified some appropriate programs, talk with your faculty adviser as early as possible to ensure that they fit into your four-year plan. Clark is committed to action-based learning, which means that as an undergraduate you can join faculty in their research. Our computer science professors, who conduct solid research and are passionate about teaching, have special interests in the subfields of computational complexity, quantum computing, robotics, computer simulation, bioinformatics, computer vision, human-computer interaction for people with disabilities, speech recognition and natural language. R. Zuniga*, and J. Magee. Eyebrow Clicking: Comparing Dwell-Time vs. Computer Vision- Based Intentional Click Activation. In the 18th International Conference on Human Computer Interaction (HCI International), Vancouver, Canada, July 2017. T. Ngo*, C. Kwan, and J. Magee. Camera Canvas: Photo Editing and Sharing App for People with Disabilities. In the 18th International Conference on Human Computer Interaction (HCI International), Vancouver, Canada, July 2017. E. Zhizhimontova* and J. Magee, “Control Yourself: A Mixed-Reality Natural User Interface” In Proceedings of the 17th International Conference on Human Computer Interaction (HCI International), Los Angeles, CA, August 2015. V. Grindle*, S. K. Haider, J. Magee, and M. van Dijk. “Virtual Fingerprint – Image-Based Authentication Increases Privacy for Users of Mouse-Replacement Interfaces” In Proceedings of the 17th International Conference on Human Computer Interaction (HCI International), Los Angeles, CA, August 2015. J. B. Guo*, L. Leung*, and J. Magee. “Academic Aide – Free Online Math Question Database for Academic Improvement.” The 5th IEEE Integrated STEM Education Conference (ISEC), Princeton, NJ, 7 March 2015. M. Duan, L. Han, L. Rudolph and S. Huo, Geometric Issues in Dimensionality Reduction and Protein Conformation Space, Workshop on Robotics Methods for Structural and Dynamic Modeling of Molecular Systems, Berkeley, CA, July, 2014. M. Li, M. Duan, J. Fan, L. Han, and S. Huo, “Graph representation of protein free energy landscape”, Journal of Chemical Physics, Vol.139, Issue 18, Nov. 2013. L. Han, L. Rudolph, S. Corbett*, M. Chou, E. Eagle*, D. Glotzer*, J. Kramer*, J. Moran*, C. Pietras*, A. Tareen*, and M. Valko*, “Configurations and Path Planning of Convex Planar Polygonal Loops”, Tenth International Workshop on the Algorithmic Foundations of Robotics (WAFR 2012) , E. Frazzoli, T. Lozano-Perez, N. Roy, and D. Rus, eds., Springer Track in Advanced Robotics, Springer, Berlin / Heidelberg, June 2012. D. Bera, S. Fenner, F. Green and S. Homer, Universal Quantum Circuits, in arXiv:0804.2429 (2008). Appeared under the title “Efficient Universal Quantum Circuits”, in COCOON 2009, pp. 418-428, LNCS 5609 (Springer-Verlag), and in Quantum Information and Computation 10 (2010) 16-27. Plasma Perturbed by Cylindrical Probe. ClarkEats: Food Sustainability on Campus. 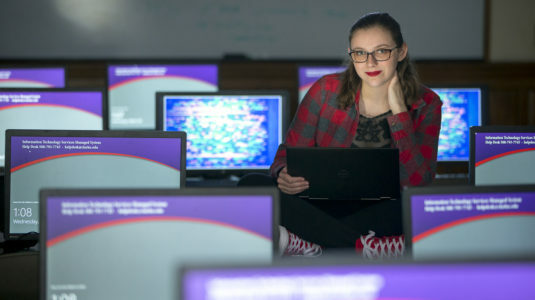 Our computer science major provides a solid foundation for students who want to apply their knowledge in other fields, as well as for those who want to study computer science in graduate school. Using the language Lisp, you’ll learn to craft knowledge representation schemes and tackle sophisticated topics like search techniques, analogy and pattern recognition, and natural language parsing and planning. Explore the role in computing of abstract data types, collections, and dynamic data structures like linked lists, stacks, queues, and binary trees. Then tackle projects that let you put these tools into practice. Get hands-on robotics experience through computer simulation or physical experiments with robot project-component kits while exploring algorithmic issues, related engineering and system topics, and current research. Gain practical experience developing software to solve a concrete problem. Follow the project’s life cycle as you and your team define user requirements, and design, document, code, test, and maintain your product. From TVs to medicine to microchips, plasmas play a big part in our lives. Learn how by studying and developing mathematical models that explain experimental work and help derive plasmas with specific properties.